Residents of Tema Newtown in the Greater Accra Region are currently living in morbid fear following what they described as mysterious deaths in the area. Two people died yesterday, bringing the total number of deaths to 17 in the last three days. DAILY GUIDE learnt that two people died yesterday after taking the prescribed spiritual bath in the sea, creating fear and panic among the residents. The spiritual bath was sanctioned by the chief priest of the area to revoke curses alleged invoked on the residents. The team from Ghana Health Service, which was dispatched to Tema Manhean, debunked reports that the people died of spiritual ailment. The fear-stricken residents, who have attributed the deaths to occultism, commonly known as ‘Sakawa’, have appealed to churches, the Christian Council, Chief Imam and other religious bodies in the country to come to their aid. They also called for full investigations of the deaths by government to unravel the mystery. Explaining further, the Assembly member indicated that “because most of the people go to work early therefore they bath before going, while some children also fetch the seawater for their parents to bath. “I don’t know whether it’s occultism at play. 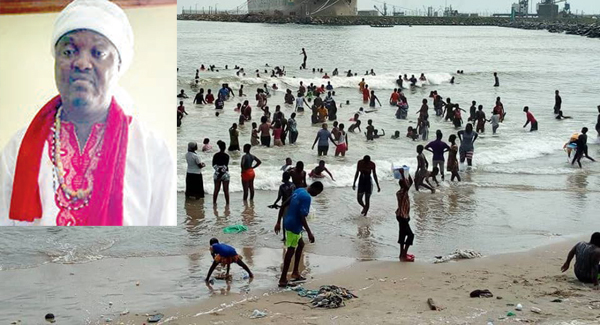 The Assembly member disclosed that several people have taken the spiritual bath in the sea, advising every resident to adhere to the directive of the chief priest to save their lives. He appealed to authorities to take the necessary steps to find a lasting solution to the problem. According to him, they would not sit aloof for the detrimental trend to continue, adding that “nobody knows who the next victim will be; I have therefore contacted the Tema Metropolitan Assembly (TMA) and the Metropolitan Health Directorate over the incident. Meanwhile, several residents thronged the beach in Tema to take their bath on the instructions of the chief priest of the area. The chief priest said each resident, who will take his or her bath in the sea, must pay GH₵1 to purchase some items to revoke the supposed curse to avert the deaths of most people immediately. According to the spokesperson for the chief priest, the residents must take precautions and bath in the sea, explaining that the spiritual cleansing of the bodies of the residents would prevent further deaths. As at the time of filing this report, the elders of the Tema Traditional Council were in a crisis meeting to find solutions to the problem. However, the Stool Secretary of the Tema Traditional Council, Nii Armah Suponu, has implored the residents to disregard the instructions of the chief priest. “The Traditional Council wishes to inform the general public that we totally dissociate ourselves from the so-called instruction that is going around asking people to go to the beach and bath in the sea,” the Stool Secretary added. He stated that although the stool expressed concern about the mysterious deaths, there was no need for people to take advantage of the situation to enrich themselves.